People at work have been bringing in cookies and loafs so I thought it might be nice for me to bake something. Originally I wanted to make muffins, but didn't find a quick enough recipe that I wanted to make this morning. I ended up with this recipe for "healthy oatmeal cookies" from Everyday Food Light from the Kitchens of Martha Stewart Living. It's another cookbook from the library. I left out the healthy part because I replaced the raisins/ currents with chocolate and caramel chips. Still, with no butter and only 1 egg they are still relatively healthy. Preheat oven to 350. Whisk together flours and baking powder. In another bowl, combine egg, oil, brown sugar vanilla extract. Add in flour mixture, oats and raisin/chocolate chips. 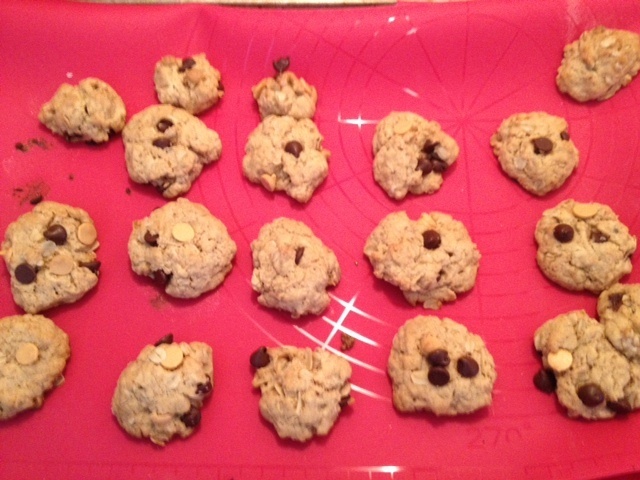 Using 2 tablespoons of dough per cookie, place on a greased (or lined- see my new silicone baking mat! present from my mom). Bake 15-17 minutes, until lightly browned. Let cool 5 minutes on baking sheet and then transfer to cooling rack.